Take the Road Less Traveled and See Something New. To say you’re a true Costa Rican insider, you have to visit places that escape other travelers’ eyes. This is why this boutique Costa Rica vacation takes you to Rio Celeste and Santa Teresa – two of the country’s most unique locations. Rio Celeste is home to a turquoise waterfall and river that you have to see to believe, and the hotel that bears its name is just as stunning. The rooms are luxurious and feature flat screen TVs and amazing bathroom products. There is an exquisite restaurant on-site serving local cuisine with a twist and ample paths to wander and see the wildlife. From jungle delights to beach front thrills: we take you to one of Costa Rica’s best beaches, Santa Teresa. Here you’ll stay in a stunning boutique hotel, where you can enjoy healthy food and daily yoga, or hit the waves and then grab a cocktail by the pool. What’s not to love? These hidden gems are awaiting your discovery! Fly into Liberia International Airport, where one of our representatives will meet you and show you to your private transfer. Travel to the lovely Rio Celeste Hideaway Boutique Hotel. 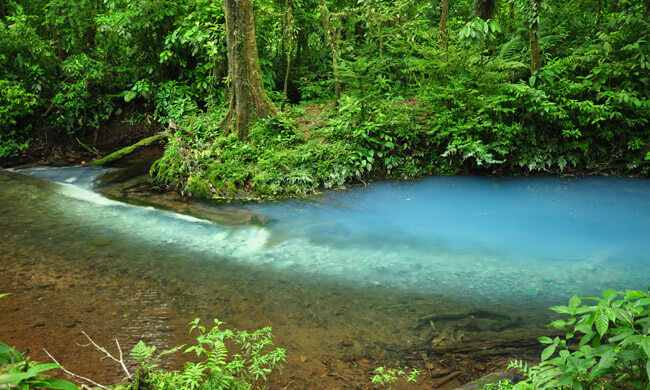 Rio Celeste is one of Costa Rica’s most stunning natural landmarks, and the Hideaway Boutique Hotel is just a walk away from the breathtaking river and national park. Use this day to go on a tour! A private transfer will take you to Santa Teresa where you will stay at the marvelous Latitude 10. Latitude 10 Jungle Beach Resort features luxurious amenities like well-appointed rooms, healthy snack bar, swimming pool, and lavish gardens. Since it’s located a few steps away from the beach, you can also take part in activities like kayaking, scuba diving, and surfing. Take a private transfer to the Tambor airstrip, then a short flight to the San José International Airport. There you will board your international flight and return home. The Rio Celeste Hideaway Hotel is the ideal choice for those looking for a secluded intimate boutique experience off the beaten tourist path. Located on one of Costa Rica's greatest beaches on the Nicoya Peninsula, this hotel is offers private retreat with personalized service and indulgent comfort.